"Some of my best ideas and most enjoyable moments come from my exchanges with other people I meet on the road." "Enjoy this brief gallery of pictures that I have taken during recent travels speaking, workshopping, advising and, above all, learning from the many teachers, policy makers, parents and concerned, engaged people whom I meet and have the pleasure to work with." "The gallery reflects my speaking and project schedule. Check back frequently." 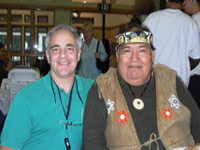 Jason sitting with Tlingit scholar and elder, David Katzeek. David, Jason and a number of teachers and elders helped direct Latseen, a two-week intensive residential experience that helped 42 Alaska Native high school students learn their first language, develop leadership skills and create digital stories about their experience. 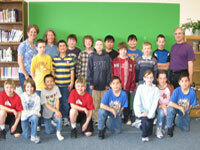 Group shot of 4th grade digital storytellers from Ms. Kelly Demko's class from Rae C. Stedman Elementary School, Petersburg, Alaska. All the students shown here created, performed and video recorded their stories, then used software to "slide original artwork behind themselves" using chroma key editing. Everyone got a DVD. Nome 4th graders created, performed and recorded their own stories in front of a green wall, then "slid original artwork" behind their performances using green screen chroma key editing. Incredible results. 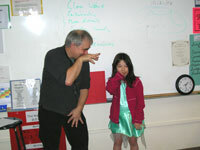 See a pictorial essay about the process at the Nome Digital Storytelling site In this photo, Jason is showing a student how to be a walrus. Jason delivers the keynote for England's national Community Learning Centre Conference in Newcastle, a wonderful town with a vibrant waterfront community. The conference was held in a grain elevator that was recently converted into a modern art musuem, gallery and creative art space. Fabulous. 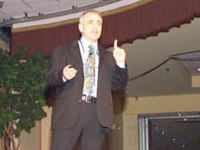 Jason delivers the keynote for 2200 technology educators at the Nebraska Educational Technology Association 2006 conference, in Omaha, Nebraska. He followed that with two featured presentations, "Digital Storytelling in the Classroom," and "Teachies are from Venus, Techies are from Mars." Sixth graders from Cork, Ireland (2005) listen with rapt attention to each other tell their original stories. Brett Dillingham and I spent a week with them, helping them create original stories as well as original artwork, which was 'slid behind them' in post production using chroma key editing. This project was part of the program "Stories of Culture and Place," in association with the University of Alaska's Geography Program. 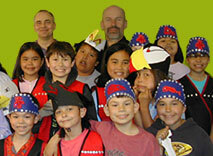 Brett Dillingham and I worked with students of the Native Immersion program to help them write and perform original stories in traditional oral style (2005). Their performances were videotaped in front of a chroma key background, much like the background used by the TV weather person, which allowed original artwork and other material to be added "behind them" in post-production, appearing as backdrops as they performed their stories. 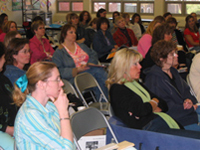 Art teachers in the Chicago area listen to Jason's keynote via iChat. "Even at a distance, I could tell they were a special group. I didn't get to work with them directly, but I got to thank them for teaching the skills and perspectives needed to communicate in the Digital Age. In a multimedia world, art teachers are teaching the new literacy: art. Art is now the 4th R."
A full-day workshop at the Alaska Society for Technology in Education (ASTE) conference. "I finally get that digital storytelling is about storytelling first, digital second," said one participant. Exactly! 7 keynotes, 11 digital storytelling workshops in 8 communities in a 2-week period for New Zealand's national education conference. Jason reports: "Fabulous folks everywhere; New Zealanders are enlightened, caring, fun people." 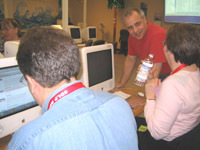 A workshop at the 2005 National Education Association (NEA) Public Relations Conference in Scottsdale, Arizona about improving technology planning by seeing technology's impacts ahead of time. As this picture depicts, I am a bit passionate about this topic! Sometimes to make a point, I turn the audience into media by taking their picture. 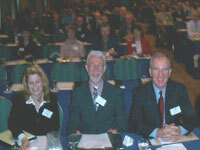 Here is my picture of those unlucky enough to be sitting in the front row at the Media Leaders Conference in Dublin, Ireland, 2004, just moments before I began my keynote. To get everyone to smile I told them to look at the camera and say "unlimited bandwidth!" It works much better than having them say "cheese." 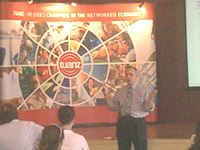 2005 National Education Association (NEA) Public Relations Conference, in Scottsdale, Arizona . The follow-up conversation is always lively. Said one participant, "You had me at the get-go when you said that teachers were primarily in the 'personal transformation business.' Right on!" 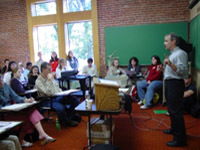 2003 Inspiration in Technology Conference, at Pacific University, Forest Grove, Oregon. "Before you sit down behind all of that wonderfully distracting high tech multimedia gear, learn what makes a story work, how to develop plot, character, meaning in order to maximize audience engagement, student interest and, ultimately learning. Right on!"